This should be fixed now, sorry about that. Recipe tooltip looks somewhat broken. It doesn't include recource icons, but should. Perhaps, because relative url for image generated? That should be fixed, now. We threw the site up really fast, so we missed a few things like that. I just made this suggestion in the IRC, but I'll post it here, too. Can we have some more powerful options for the tooltips, such as auto-coloring the text for the rarity of items, supplying the name, showing item icons, etc? 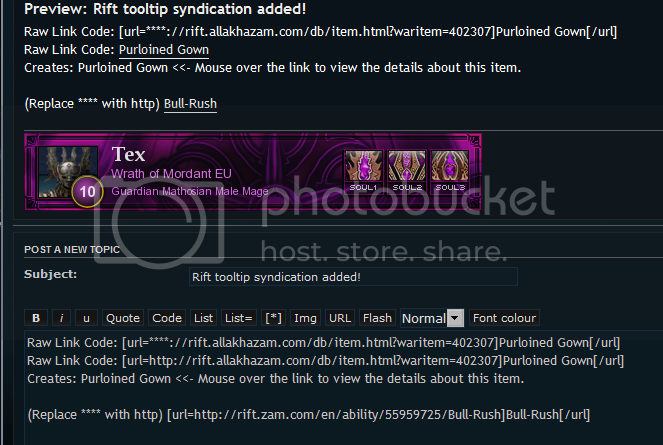 Curse's tooltip code does this, and Wowhead's tooltip code is very powerful as well, with all sorts of options. These features are sort of needed to make rift.zam.com used over Curse's competitor, which seems friendlier to implement on fansites and such. im trying to get this tooltip thing on enjin, but somehow i cant make it to work. I do get the tooltips by emblem, but if i hover over the item i cant see the item, i can only click the link and it directs me to the page i linked the item from..
not sure if it can be implemented for enjin forums/site but i really like to as the guild im running just started raiding and i really want to setup the DKP etc. If you could post a link here or send me a PM so I could take a look, I can likely help you get them working. Or at least give you an answer for sure if they will not work or not. Lookup Glowing vengeful rune for an example. Any chance these could get fixed? 1) The link color doesn't correspond to the item color. All links are white. Howdy, thanks for the option. Rift tooltips are faded, where other game tooltips are not, as seen here. However, in a boring old plain html file, they are all fine. This persists across both default themes and custom. I am having the same issue with my SMF 2.0RC install. The text inside the tooltip is all greyed out. Here's a screenshot. Any help or suggestions is greatly appreciated. This will make it the default setting that the link appears with a small icon. Will this be possible at ZAM? 2) And even more importantly: The link appear with the rarity color. This is the best rift database hands down, but the lack of features on the tooltip side is still making me keep the other alternative(s). Icons should be appearing on mouseover now. We are currently not coloring the links on others' sites, but we want to add that as an option. Can you give a link to that page so I can take a look at what's going wrong? I'm setting up a wiki for our guildies to exchange specs, items, skill rotations, etc. A lot of my users (and myself) don't want to look up totally random strings of numbers just to link to a file. Why doesn't the provided js API attempt to do the conversion of Name -> ID -> Item? I'll try this out with a demo template soon. But why isn't this mentioned in the Tooltips writeup? I'm curious what magic this does with the abilities.... putting the link below into a browser sends me to a disambiguation page. But works with the tooltips. Am I in danger of this breaking in the future? That's because there are several different ranks/versions of Backstab, so it doesn't know which to forward you to. The Wiki link is still valid, there are just a lot of "Backstab"s available in the database. 4. Select from style edit "All Style Options"
5. Under "Common Templates" find "Footer"
7. Paste in the ZAM Script at the very bottom. As a previous user posted, I am using SMF 2.0 RC5 and have the same problem in any template, where the tooltip information is unreadable (very dark grey on black). Just wanted to know if others are experiencing the same! Not sure if anyone can assist here, or whether I'm on the complete wrong track or not, but I'm trying to simplify the commands needed to display the tooltip in phpBB3. I remember doing this kind of setup from Curse back for Aion & Warhammer, but can't seem to figure out what I'm missing, or where I'm going wrong. So to confirm, the above works correctly. Now that's not what anyone wants. So, my question is, is there a way to re-write the name of the item somehow to replace the ID? Am I miles off track here and just over-complicating this? or is there a way to do what I want? Fixed. You may need to do a hard refresh (Ctrl + F5) to get the updated tooltip styling. Let me know if you still see it having issues anywhere. Thanks for the bug report!